A reconstructive plastic surgery known as flap prefabrication is giving a 22-year old Chinese man who lost his nose and new life back. The strange part of the story is that doctors are growing and sculpting a new nose on his forehead, that will be later transplanted back into the man's nasal cavity. The Chinese man nicknamed Xiaolin, whose real name is behind withheld, was involved in car accident last August and suffered a severe nasal trauma, and his damaged nose later became infected, because he did not receive surgery. Unable to perform surgery after the infection, doctors in Fuzhou, Fujian province of China decided to use flap prefabrication to sculpt a new nose for him using skin and cartilage from his ribs. 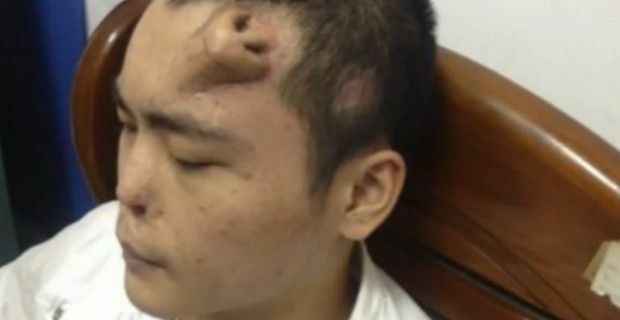 Doctors decided to use the man’s forehead to grow the skin and cartilage on his forehead while waiting for the blood supply to grow into the tissue, placing a skin tissue expander onto Xiaolian's forehead before modeling the tissue into the shape of a nose. In Xiaolin’s case the complex procedure seems to have taken a few months, but the actual replacement surgery has yet to occur. "We have gone through the hardest step and now it is not difficult to carry out transplant surgery," said Guo Zhihui, Director of Plastic Surgery Department of Xiehe Hospital Affiliated to Fujian Medical University, told the Post . Xiaolian is not the first person to have a nose grown on another part of his body. At the beginning of the year there was a British businessman who lost his nose to skin cancer was reported as having new one growing on his arm. University College of London’s Professor Alex Seifalian made the British man’s nose starting with stem cells and a glass mold. Dr. David Cangello, an attending plastic surgeon at Lenox Hill Hospital and Manhattan, Eye Ear and Throat Hospital in New York told Live Science that this type of procedure is just a variation of a plastic surgery technique. "I would call it a different take on a principles that we commonly use in reconstruction," said Cangello.